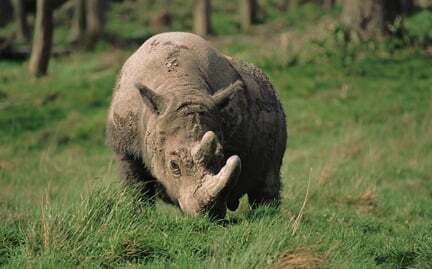 Inhabiting the islands of Borneo and Sumatra in Indonesia, the Sumatran, or hairy, rhino is the smallest of the living rhinoceroses, weighing just 1,300 to 1,700 pounds. Due to habitat loss and poaching, the Sumatran rhino is critically endangered with approximately 300 individuals currently existing in the wild. Urgent measures are needed to save the forests where this rhino still survives, and it is imperative that trade in rhino products be halted immediately.